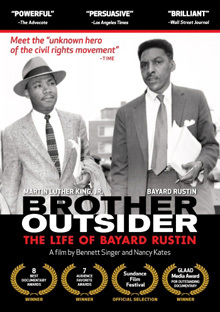 Out in Reel Film Series Screening of "Brother Outsider"
Learn about the life and work of Bayard Rustin, a visionary strategist, activist, and the unknown hero of the civil rights movement. Rustin was silenced, threatened, arrested, beaten, imprisoned and fired from important leadership positions, largely because he was an openly gay man in a fiercely homophobic era. Series Presented by SBAI, Pride Alliance, the Warner LGBTQI and Allies SIG, the Pride Network, and the Film and Media Studies Program.